Start-up operator Rural Broadband has been installing CableFree equipment to deliver Broadband Internet services in The Cotswolds, UK. In the UK, rural communities suffer poor Internet from fixed line providers such as BT, due to slow roll-out of fibre internet and poor quality copper lines. Residential users experience slow or unreliable broadband connections and have no alternatives. Wireless Broadband presents an excellent alternative: High speed & Reliable connections, at low total cost of ownership. Mounted high on the Church tower, the sector antennas are the only items visible – with the outer edges carefully colour-matched to the stone of the historic church tower. Founded in the 13th Century, the Church spire dates from 1500s. The installation was planned using non-invasive mounting methods to respect the structure, sitting on the parapet to ensure no damage to the historic structure, which is a Grade II Listed Building. Looking from the ground, the entire Base Station is almost invisible to the eye and was approved by planners. For core internet backhaul, a 1Gbps Fibre Optic service from a major national provider was installed at the local village school. This feed is connected up to the Base Station on the Church Tower by a dedicated Point to Point radio link with up to 867Mbps capacity. Higher capacities are available up to 10Gbps if needed. Each residential subscriber has CableFree Pearl CPE devices installed. These are small, compact, low cost and low-visual impact: much smaller than a satellite TV dish, the CPE can be mounted at almost any location on the buildings. These CPE devices are pointed at the base station and receive the wireless broadband signal with distances up to 5km or more range. The CPE is capable of delivering up to 500Mbps capacity, which in typical use is limited to around 50Mbps to provide “fibre equivalent” services and avoid saturating the backbone feed, with capability for future capacity upgrades. For sites at longer distances, higher gain devices are available with larger antennas. An indoor residential router gives the subscriber wired Ethernet LAN and Dual-band WiFi connections inside their home. 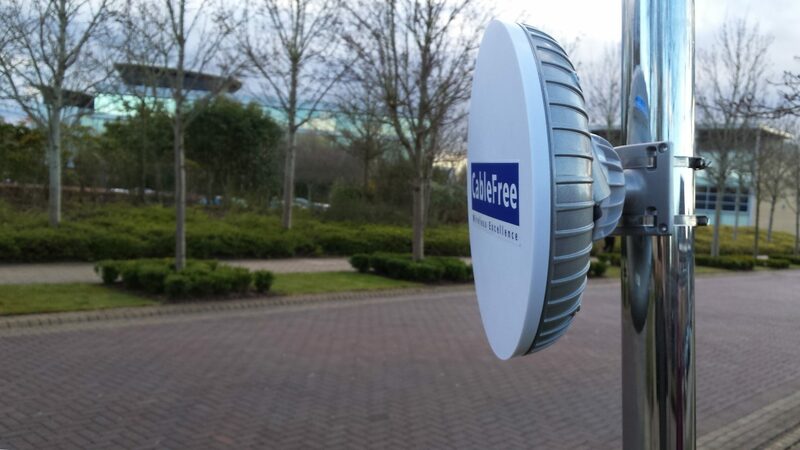 The CableFree MIMO radio range is available in both licensed and unlicensed bands. Some operators have access to licensed bands such as 2.3 or 3.5GHz. However outside cities in low-density rural locations, the unlicensed/semi-licensed (rules depends on country) 5GHz band is perfectly usable, with no or low levels of other signals in the area. For this project we selected 5GHz knowing that the spectrum was clean. CableFree equipment uses the very best hardware, antennas, link margins, chipsets and software to deliver signals without interference or slow-down. Broadband Wireless is an ideal technology for connecting Rural communities where traditional Fibre Optic and Copper broadband technologies are often unavailable, too slow, uneconomic or unreliable. A village can be enabled with Broadband wireless in as little as a single day, with suitable planning. Total costs are lowest of all broadband solutions. High capacities are available up to 500Mbps per subscriber or more.